The state opposition leader's remarks came after his meeting with Governor NN Vohra in the wake of BJP pulling out of its coalition government with the PDP in the state. Omar Abdullah during the press conference. 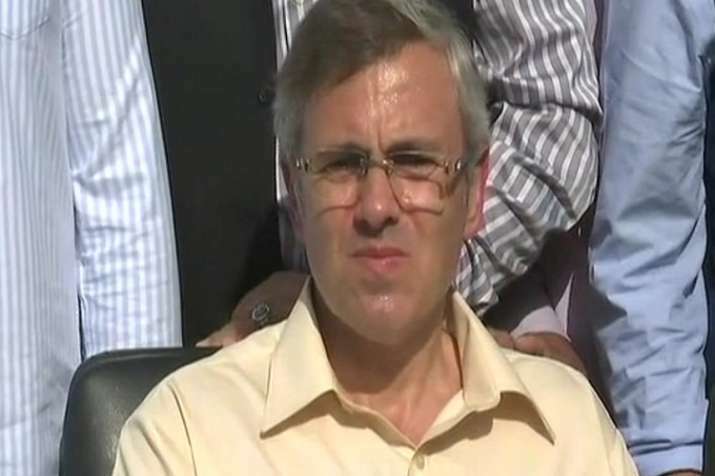 National Conference leader Omar Abdullah on Tuesday said his party would not stake claim to form the government in the state since it did not have the mandate. "I have met the Governor just now. I told him that the NC did not have mandate in 2014 nor it has in 2018. "We are not in talks with anyone to form the government. Nobody has approached us. We are also not going to approach anyone," the former Chief Minister told reporters here. Governor's rule should be imposed in the state in such situation but it should not be in force for long, he added. "There is no option left but to impose the Governor's rule in the state. We have requested the Governor to hold early election so people can decide who they want to bring to power in the state," he said. "We also requested the Governor that Governor's rule should not remain imposed for a long time period. After all, people have the right to choose their government. Fresh elections should take place and we will accept the mandate of the people", he added. Abdullah said he had assured the National Conference's support to the Governor but added that the Governor and his administration must ensure that early elections are held to put an elected government in place. "As a responsible political party, we will work for peace in all the three regions of the state." Asked about the possible reasons for the BJP's pullout from the government, the National Conference leader said: "I can't speak for the BJP. They alone can explain what prompted their decision. "Yes, I was surprised by the timing of the BJP decision. I expected this to happen later this year, but it happened sooner because of the deterioration in situation." Asked whether the BJP had embarrassed the PDP by taking a unilateral decision, Abdullah said: "Whether PDP is embarrassed or not they would know, but I feel the BJP should have taken the PDP into confidence. "But different parts function differently. They (BJP) claim radicalization and obviously they have better access to information than us. "We believe that both these parties have together pushed the state down the precipice." Asked about his party's earlier offer of support made to the PDP, he said: "That was a one time offer and after they joined hands with the BJP, that offer ended." Asked if his party was happy about the development, he said: "We do not celebrate this break- up. We are mourning the demise of democracy in the state". Would he ask the Governor to keep the state Assembly in suspended animation or seek its dissolution? Abdullah replied: "That is the prerogative of the Governor and of nobody else." Earlier, in the day in a cryptic remark he posted on Twitter, the National Conference leader hinted that the alliance with two parties with such polarising ideologies will break eventually. "And so it has come to pass...", he had tweeted. Meanwhile, Chief Minister Mehbooba Mufti has submitted her resignation following BJP's decision to pull out from PDP alliance. The decision was taken during party president Amit Shah's meeting with J&K ministers and top leaders in New Delhi. Announcing that the BJP has decided to pull out of the alliance, BJP leader Ram Madhav told reporters that it has become untenable for the party to continue under present circumstances. Madhav, who played a major role in stitching the alliance three years ago, said the decision was taken in view of larger interest of national integrity. He said that the party was not happy with the working of Mehbooba government. The BJP's decision to walk out of the alliance came a couple of days after the Centre announced that it is ending the month-long Ramzan ceasefire against terrorists in the Valley. The PDP was reportedly unhappy over the move.